As I was making the French Friday's with Dorie, Around My French Table soup, by Dorie Greenspan, I was thinking about a few things I want to share with you. They're about chicken stock. Have we talked about stock before? Of all the things to make at home, I think this tops the list. It's inexpensive to make and so much better than you can buy. About three Thanksgivings ago, I was at my sister's house. We had finished our feast and were dividing the leftovers between the families. Her mother-in-law asked if we would like some turkey. I'll never forget the look on her face when I asked, "Could I have the carcass?" To me, that was the best part to take home. I'd add some carrots, celery, onion, garlic, and peppercorns to the carcass with lots of cold water, and start the simmer. From that big bird, I'd have 7 or 8 quarts of liquid amber stock ready for the freezer. I usually don't make stock with whole chickens. It's always a carcass from a chicken I've baked. True confession... I even make stock from the deli chicken we pick up in a pinch. The stock is a little saltier, but really good. In the time it takes you to watch an evening of TV, a few football games, or just putter the day away, you can make chicken stock. Here are the steps, tips and tricks I've learned along the way. In a big stock pot (as big as you have), add 1-2 chicken carcasses or 1 whole chicken. Wings, necks and backs are great to keep in the freezer for stock day. 1 leek, if you have one - cut into pieces and very well washed. You don't want grit in your stock. If you have any leftover roasted vegetables from your chicken, add those too. Fill the stock pot with cold water, about 2 inches from the top. Depending of the size of the stock pot, you'll have a few quarts of liquid. Turn on the heat, and bring the stock to a very long simmer. You may have some scum float to the top. Skim that off and discard. Don't stir the stock, just let it simmer undisturbed. Be sure not to let it boil to hard, or that will make if cloudy. You can put a cover over the pot, but keep it ajar. Check if periodically, adjust the heat to maintain the low simmer. There should be tiny bubbles around the edges and near the surface, but nothing too forceful. You can let the stock simmer for several hours. The longer it simmers, the deeper the flavor and richness of the stock. You will loose some of the liquid. It may reduce, but you can add more water if desired. When you're ready to finish the stock, line a colander with cheesecloth or a clean handkerchief that you don't mind getting "stocky". Using a large bowl or another pot under the colander, gently press a ladle against the surface of the stock removing the broth, and strain through the cheesecloth into the bowl. Try not to stir. You'll get some chicken bones and vegetable pieces in the colander. It's okay. When you have most of the liquid out of the pot in the second bowl or pot, discard the solids. Here's an important food safety tip: Get the stock COLD quickly. Bacteria will double every twenty minutes when the temperature is between 40 and 140 degrees F. I make an ice bath with cubes and water, and place the bowl with stock the bowl of ice water. If you have a lot of stock you may have to work in batches. It may also take more than one batch of ice water. When the stock feels barely warm to the touch. Transfer to the storage container, label and place in the refrigerator for three days or into the freezer. I like to put in the the frig overnight, and skim off any fat that floats to the top, then freeze. When you're ready to use it, I run the container under warm water, release the stock cube, and put it in the soup pot frozen. It melts quickly and cuts the time needed to defrost. For risottos and dishes requiring warm stock, I thaw in the microwave or in the refrigerator overnight. I use one quart deli containers and freeze about 3 quarts at a time. I bought a case of containers and reuse them as much as I can. Maybe I should put sets of 6 in the shopping area of the website so you can have access to them too. I want to tell you that Michael Ruhlman, a fantastic writer and chef has invented reusable straining cloths. They come in three sizes and work really, really well. If you're planning to be a stock maker, I suggest investing in these guys. Now on to the soup recipe! 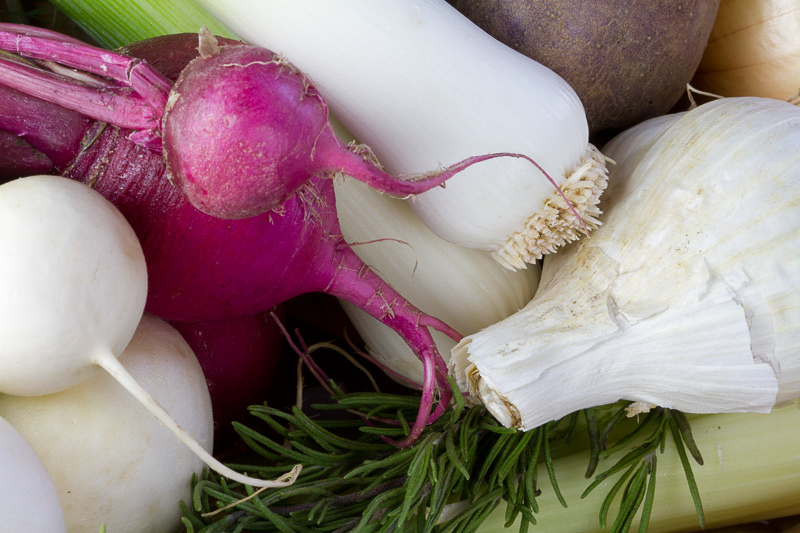 Our refrigerator is still full of vegetables from our CSA. In addition, one of my cooking school students brought me a bag of the most gorgeous carrots. They're huge! I took a picture of them, and then decided you needed a reference to see how big they really are so I added the pencil. Here they are! That's a regular pencil next to them. Aren't they amazing?!? I took several liberties with the Around My French recipe, adding a few more kinds vegetables, and a few other herbs and spices. The soup is delicious! I didn't puree mine, though that would be great too. The carrots, celery, onion and potatoes are the heart and soul of the recipe. Any other vegetable you can add are a bonus. I debated on green pepper and decided to leave it out for fear it would be too strong. The ginger adds a subtle note that is hard to describe. I would consider this a secret ingredient with a certain je ne sais quoi. Fasten your seats belts, this a recipe you'll make again and again. I've been making it so long, I'm not even sure where the recipe came from. This recipe is a standard in my Autumn Soup class. It's easy, and SO good. My friend Meghan gave the recipe to a local restaurant and asked them to make it for her bridal shower. People loved the soup. Even those not too keen on squash soup. It can be a fancy appetizer course or a casual supper. The bacon and apple make it sweet, salty and savory. It's got Fall written all over it. To start your soup, find a nice big pot, and fry the bacon strips in the bottom. Place the bacon on a plate with a paper towel, to drain and cool. Then chop into little garnishing pieces and set aside. If you have a lot of drippings, pour some off. Keep about 1/2 - 1 Tablespoon in the pan. Add a little olive oil if you need it, and then add the onion, garlic, and leeks. Cook until the onions are looking clear. Now add the chunks of squash, the apple, chicken stock, water and a bay leaf. Add some salt and pepper, and simmer. Fifteen minutes. Yes, you read that correctly. Just 15 minutes, and your squash should be tender. The soup after the simmer, ready for the blender. Here's where you can be creative. If you like your soup chunky, you could mash it, or use an immersion blender to make it smoother but chunky. I'm a smoooooth soup person. Think liquid velvet. I use my VitaMix and whirl it to smooth. You could also use a food processor or blender. Just please be careful. The soup is very hot, and any of the tools can spew soup without warning. After you've arrived at your desired consistency, Ladle your pretty soup in a bowl and garnish with sour cream/Greek yogurt/creme fraiche, the bacon pieces and even some diced apple. In a stock pot or large pan, cook the bacon until crisp and drain. Reserve 1 T fat. Crumble/coarse chop the bacon. Cook the onion, leek and garlic in the reserved fat. Stir until softened. Add the squash, apple, bay leaf, stock and 1/2 cup water. Bring to a boil, reduce to a simmer. 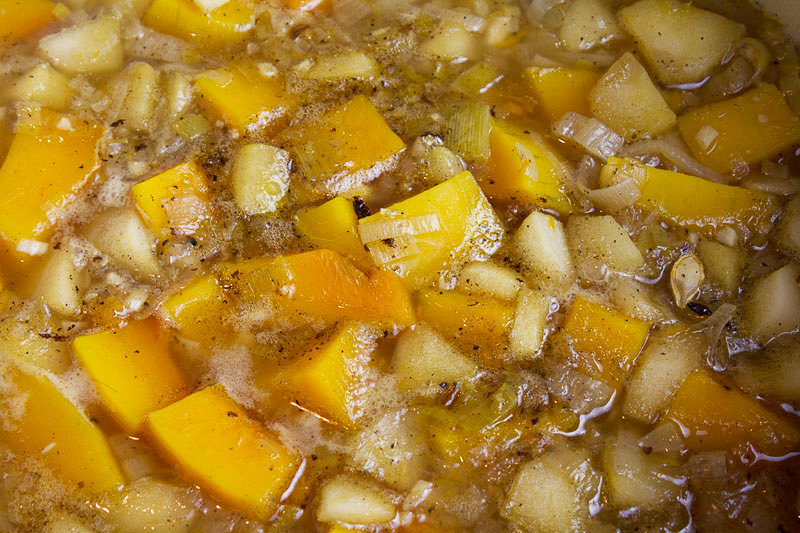 Cover and simmer for 15 minutes or until the squash is very tender. Discard the bay leaf. Season with salt and pepper to taste. Transfer soup to blender and puree in batches. Transfer pureed soup to a clean saucepan. Adjust seasonings as desired. Either whisk in 2T of sour cream or ladle soup into bowls and garnish. Add bacon to the top of the soup and serve. Makes about 4 1/2 - 5 cups. vegetable guilt. What is it? It's the feeling you have when your CSA box arrives before you've finished the vegetables from the week before. Some of your lettuce is squishy, with a few squash looking ready for compost. Never fear. 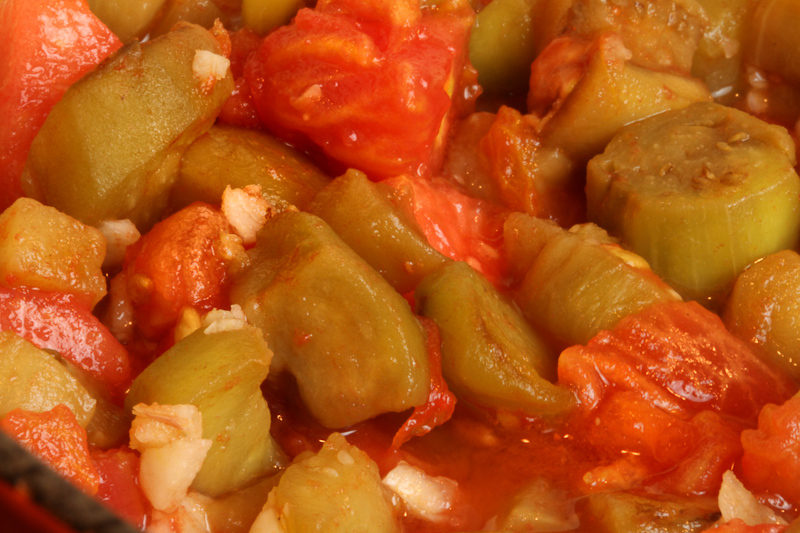 I've got a recipe for you to use your extra eggplant, tomatoes, onions, and even those white beans from the winter. This recipe was adapted from Mastering the Art of French Cooking by Julia Child. She considered this a peasant soup. I like it because it bridges the seasons. You use fresh summer ingredients, but have the earthy, warm flavors that help you coast right into Autumn. 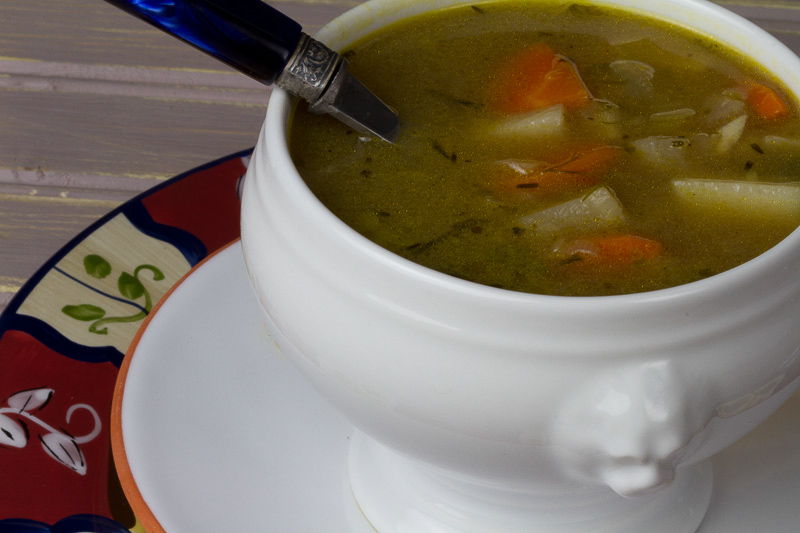 This is a great soup to add sausage, ham or bacon to. Freeze the soup, and add the meat of your choice later. The recipe starts out with Northern Bean in a quick boil and soak. While they're soaking, wash and I mean wash the leeks. Everything is going to be pureed, so you can dice the leeks then rinse under running water. There's nothing worse than skimping on this part, then getting a sandy bite of soup later. 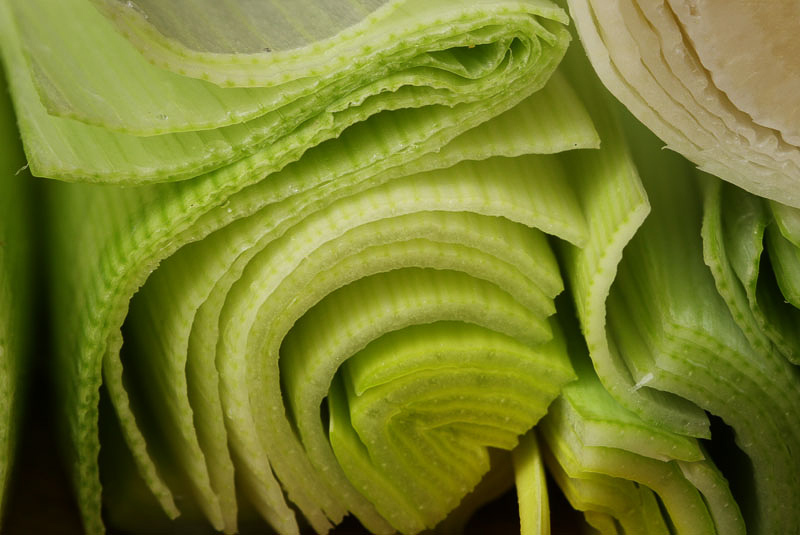 With butter and olive oil, cook the leeks until they're translucent and tender. I added sage, thyme, salt and pepper to them while they were cooking. When the beans are finished, add the leeks to the bean & water and simmer partially covered for 1 and 1/2 hours. Julia is very exact. Once the soup base has simmered, carefully puree the mixture until smooth. Be careful- hot soup and blenders don't aways play well together. While the base is simmering, peel, dice and salt the eggplant. You'll also peel, seed, and dice the tomatoes. Be sure to save the juice. To easily peel a tomato, heat water to simmer. Make an X on the bottom the tomato and gently drop into the water for about 30 seconds. Lift out with a slotted spoon and rinse under cold water. The skin should slip right off. Then, cut in half, and run your index fingers in the seed pockets to remove the seeds. Then... dice! Cook the leeks and onions in the butter/oil until soft and translucent. Add to the beans (with their water) and add the herbs. Cook for 1 1/2 hours covered slightly. When the base has finished simmering, purée in a blender, food processor or with an immersion blender. 1 pound or about 3 medium tomatoes, peeled, seeded and cut into 1/2 inch pieces with the juice saved. Sprinkle the salt over the Egglant and let it stand for about 20 minutes. Pat dry. Heat the oil in a large skillet and sauté the Egglant until light brown. Add the garlic and tomatoes. Simmer the mixture for about 15 minutes or until the eggplant is tender. Thin the leek/bean mixture with the stock to desiredconsistency, then add the eggplant/garlic/tomato mixture. Simmer for about 5 minutes, adjust seasoning with salt and pepper. Then serve, adding the fresh herbs to the top. Your could also add sliced browned sausage, or kielbasa. Heat a enameled dutch oven or frying pan the oil until it's hot. Add the eggplant and toss to give it a nice brown crisp outside. Add the tomatoes, and the garlic. Simmer for about 15 minutes, or unti the egglant is nice and tender. Add this mixture to the pureed soup base and adjust the seasonings. I needed to add a little more salt and lots of pepper. To serve, garnish with fresh herbs such as sage, thyme or chives. A few weeks ago, we had a wonderful chance meeting with friends in Milwaukee. They began telling us about the sous vide system they had, and how much they love it. Soups, meats, cooking, reheating, holding... everything was wonderful. Well, it took about three days, and we had ordered a system for us. This is going to be so fun! Sous Vide, or under pressure is a method of cooking used in high-end restaurants. Food is vacuum packed, then placed in a warm water bath. It cooks slowly, evenly and produces amazing food. The basic system includes a vacuum sealer, the sous vide water bath, and the bags for sealing the food. It's kind of cooking backwards. Meats are cooking sous vide, then seared just before serving. Since the temperature is held constant, nothing can over cook, burn, or lose its texture while waiting to be served. Our first sous vide preparation was chicken. We vacuum packed two chicken breasts with just a bit of butter, salt and pepper and placed them in the water bath for 2 hours. Upon removal, it was truly amazing. The chicken was plump, completely cooked, and very moist. I guess it didn't occur to me that the juices had nowhere to go but into the chicken. I quickly seared the chicken on a grill pan for color and come crispness on the surface. A quick pan sauce and ta-da! Chicken breasts, like we didn't know existed. Our second meal was Tomato Bisque Soup. I thought this would be a perfect option. The soup is made with a white sauce containing milk and cream and should never come to a boil once combined with the tomato and vegetable. Enter Sous Vide! After the soup was complete, I ladled it into bags, used the Archimedes' Principle ( slowly lowing the zip bag into the water, allowing the water to squeeze out the air, then zipping shut). I held the soup at 172 degrees F, just a few degrees about the perfect serving temperature. Hours later when we where ready to serve the soup, I removed the soup from the zipper bag and into the soup bowls. No scorching, separating, reducing, just perfect soup. One bag of soup remained in the sous vide bath. I made an ice water bath, and quickly dropped the temperature of the soup for safe food handling. That bag went into the refrigerator for another day. When we're ready, I can place in back into the preheated sous vide water, for 45 minutes or so, and have soup at just the right temperature again. Here's the Tomato Bisque Soup recipe. I've adapted it from The Oven of Brittany, a sweet Madison restaurant, from years ago. In a large saucepan, melt the stick of butter. Add the flour and stir quickly to creat a roux. Cook for a minute two, then stirring/whisking constantly, add the milk. Continue stirring over medium heat until the mixture starts to thicken. Then add the cream. Continue stirring/cooking until the mixture thickens. Do not heat to a boil. Remove from the heat. In another stock pot or large saucepan, melt the remaining 2 T of butter. Saute and onions, green pepper and garlic until the onions are translucent. Add the tomatoes and basil and bring to a simmer for 30 minutes. If you like the texture a more uniform, use an immersion blender to further chop the cooked tomato pieces. Be sure to reduce the heat to barely a simmer, then add the white sauce. Add the cayenne and/or tabasco and adjust seasonings. Hold under a boil to prevent separation. At this point, if you have a sous vide system, preheat the water to 172-175 degrees F, and place the bags in the water after removing the air. Hold until ready to serve. When ready to store, prepare an ice water bath and emmerse the bag in the ice water for at least 45 minutes. Add ice as needed to keep the water very cold. Hello everyone! I guess I accidentally took the summer off from FFWD. The summer included fun vacations, our first season of pastries and breads at the local Farmers' Market, watching our mini wheat field grow, and best news of all... learning that we're going to be grandparents! It's the beginning of the school year, and time to start cooking again. This month's recipes look great and will be great fun to share. Our friends had TWO children get married this summer. One in Rhode Island, and one is NYC. Luckily, Irene threaded the needle between trips and we were able to enjoy the best both cities had to offer. Meals included lobster bisque, rolls, and mac-n-cheese... yum (not all in one meal...)! There are so many great restaurants in New York. After touring the Chelsea Market, we made reservations at Morimoto and enjoyed a feast of sushi and stunning entrees. We had doughnuts at DOUGH in Brooklyn, and Oxtail Ragu in the Meatpacking District. The travels were inspiring as well as tasty! included several ears of perfect sweet corn. 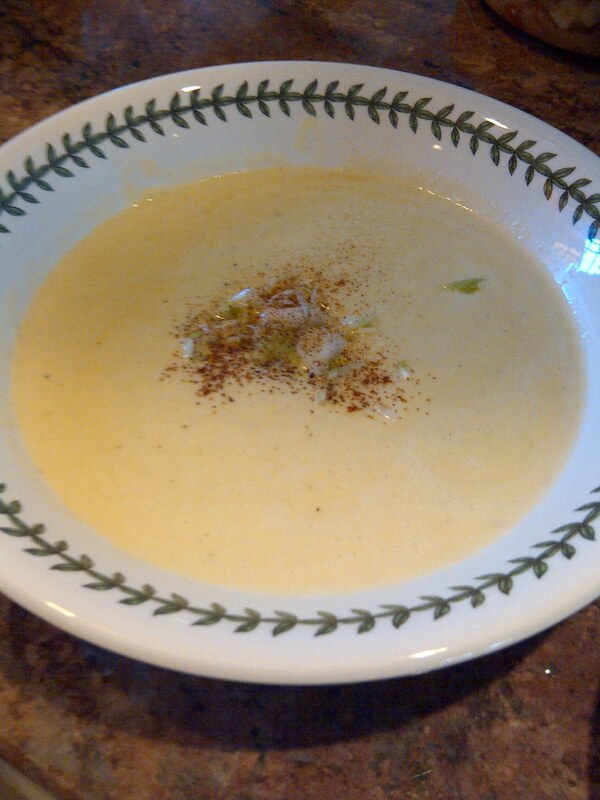 Just what I needed for this week's recipe, Corn Soup. It was a very warm day and not exactly a day for eating soup, but what the heck. 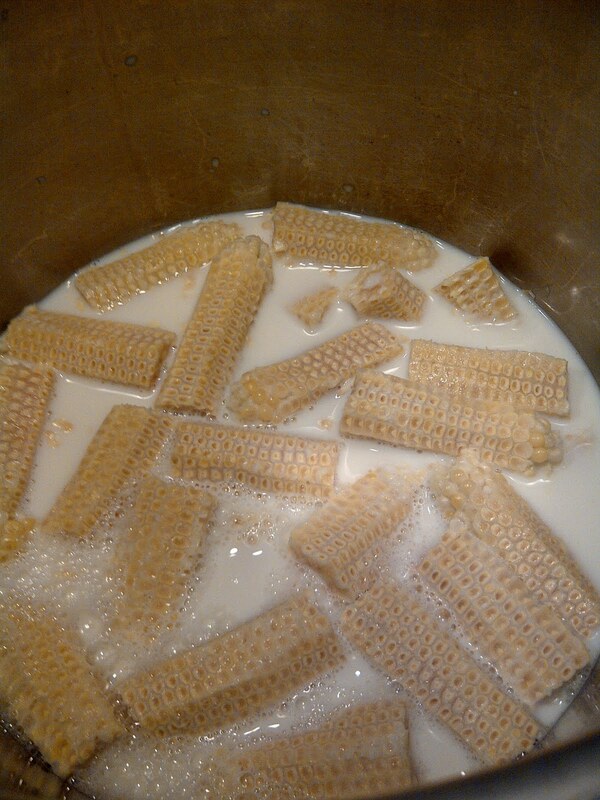 There was a lot of corn so I made triple batch of soup to freeze for later. 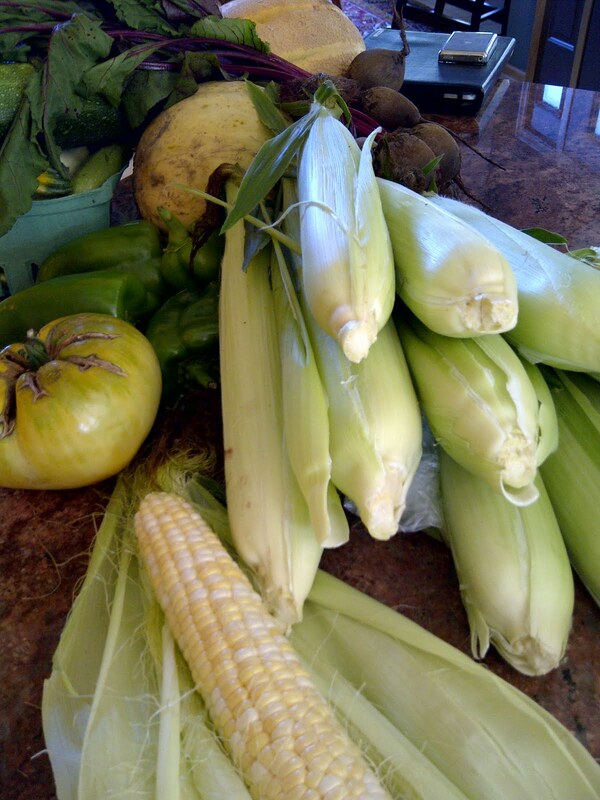 Here's the unpacked CSA box and the gorgeous corn. The recipe calls for simmering the cobs in milk then combining the infused milk the the sauteed vegetables. 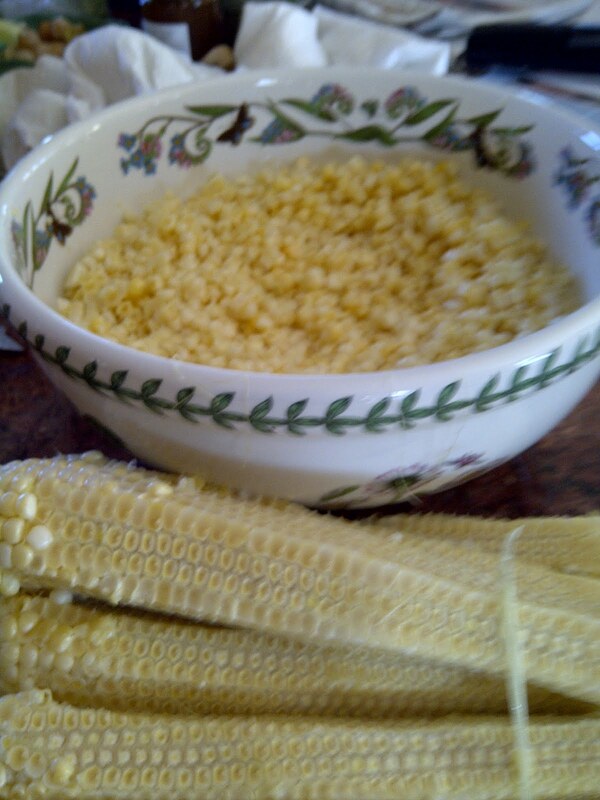 Here's the corn and cobs ready for the pots. This recipe, like many of Dorie's recipes, is simple, yet expert at bringing out the perfect flavors of each ingredient. Once the kernels of corn, and mirepoix have sauteed, the two pots were combined, then pureed to a beautiful velvet consistency. Last year I had the luck of becoming the proud owner of a Vitamix blender. At the time I found it hard to believe that it would really make a big difference. Wrong! The blender sounds like an airplane taking off, and produces flawless results. The corn soup was truly liquid velvet. I garnished with thinly sliced scallions, and a dash of chipotle chili powder for a splash of heat. We had the soup for dinner with tomatoes and crusty bread. Then, the next day I served the soup as an amuse bouche in tiny glasses without garnish. I didn't tell our guests what the soup was, and had them guess. The guesses included celery, leek, and hmmm " I know this flavor so well, but can't place it". The texture was so smooth and silky that the strong presence of corn was hard to place. 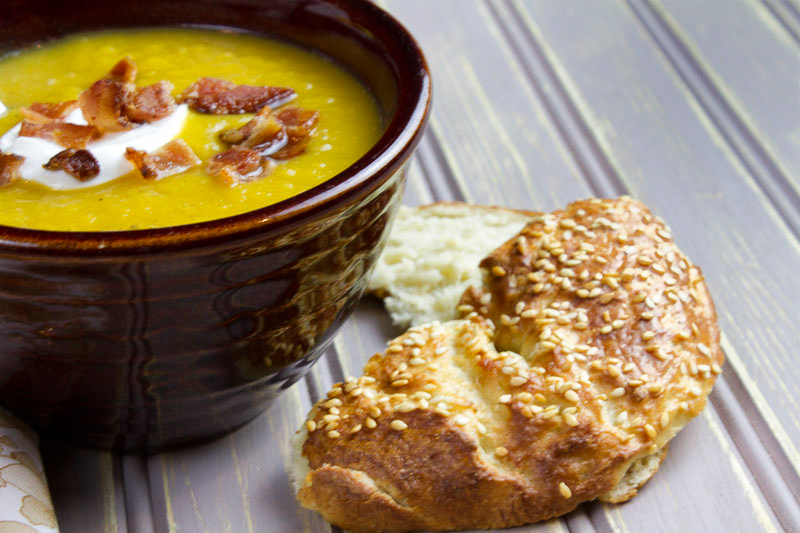 I would highly recommend this soup as a fall appetizer. I preferred the soup without garnish, and just the dash of chili powder. The best part was Gary's critique of the recipe... "Incredible"